Anaco Stainless offers special stainless steel perforated plate for filter beds in water treatment and related technologies. The use of stainless steel perforated plate in Water Treatment Works is becoming more common. 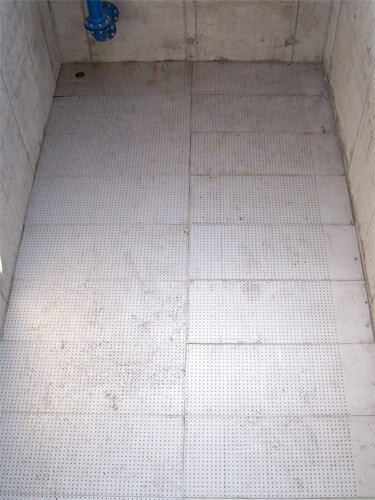 Where ceramic tiles need to be entirely replaced, a cost effective option is to adopt the use of perforated stainless steel plate. 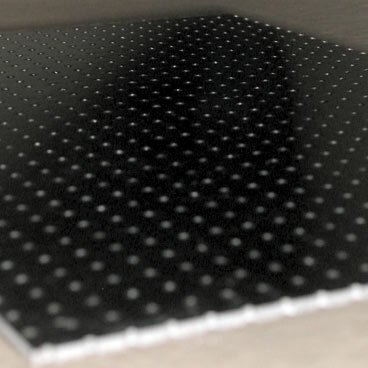 Any design of perforated plate is possible and can be delivered to site within workable lead times. We specialise in meeting specific design requirements and do not 'stock' any specific range of perforated plate. We have found that there is very limited commonality in size of area to be covered and 'Open Area' design varies from one facility to another. Progressively, the size of individual plates /sheets is reducing in response to 'handle-ability' on site in order to meet Health & Safety Executive requirements for lifting. However, large sheets can be made 3m x 2m if required. We aim to provide an intelligent and reliable response to any perforated plate enquiry. We are able to supply common stock sizes of perforated plate within days. In order of usage, common stainless alloys supplied are: Grade 316, 304, 318 and 204 for indoor architectural applications. Sizes of plate range from 50mm x 50mm to 3000mm x 2000mm. Thickness of sheet or plate is based on specification. Most projects are very application specific: please contact us for advice, details and pricing. We also supply standard and non-standard size perforated sheets for engineering and decorative applications.